New Zealand athletes have won a total of 120 medals, with all but three won at the Summer Games. The most successful sports have been rowing and athletics with 24 medals each; sailing follows closely behind with 22 medals. New Zealand's three winter medals have come in alpine skiing in 1992 and in snowboarding and freestyle skiing in 2018. The 120 medals won by New Zealand put New Zealand at number 34 on the all-time Olympic Games medal table for total number of medals and number 26 when weighted by medal type. After the 2016 Summer Olympics, 1371 competitors have represented New Zealand at the Olympic Games. Harry Kerr is considered the first Kiwi Olympian and Adrian Blincoe the 1000th. As at 11 June 2009, of the 1111 Olympians to that date, 114 were deceased and the whereabouts of 21 were unknown. By 25 June 2009, only 9 Olympians had not been located. There are no living Kiwi Olympians from before the 1948 Olympics in London. The first person from New Zealand to perform at the Olympic Games was Victor Lindberg, who competed for the Osborne Swimming Club of Great Britain which won the Water Polo at the 1900 Summer Olympics. Due to its location in the South Pacific and distance from the early Olympic host cities in Europe and North America, New Zealanders needed to endure long sea voyages to participate. 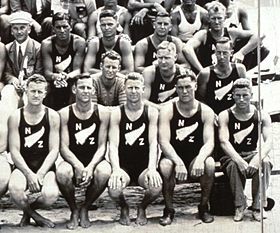 New Zealand sent its first independent team to the VII Olympiad in 1920, comprising two runners, a rower, and a 15-year-old swimmer. Prior to 1920, three New Zealanders won medals competing for Australasian teams in 1908 and 1912. Since the advent of international jet air travel in the 1950s, and the greater number of Olympic sports, the size of New Zealand Olympic teams has increased substantially. New Zealand, as with other Southern Hemisphere countries, has had the disadvantage of needing to peak to compete in summer sports which are held during their winter months. Only three Olympics have ever been held in the Southern Hemisphere, the 1956 Summer Olympics in Melbourne, the 2000 Summer Olympics in Sydney, and the 2016 Summer Olympics in Rio de Janeiro. New Zealand has had a much smaller participation in the Winter Olympics, owing to its oceanic climate and Southern Hemisphere location requiring athletes to peak in the middle of the New Zealand summer. The nation did not assemble their first Winter Olympic team until 1952. In 1988 the team included bobsleighers; the first entry in a winter sport other than alpine skiing. In 1992, Annelise Coberger of New Zealand became the first person from the Southern Hemisphere to win a medal at the Winter Olympics when she won silver in the slalom at Albertville in France. In 2018, Zoi Sadowski-Synnott won New Zealand's second Winter Olympic medal in the inaugural big-air snowboarding competition in Pyeongchang, South Korea, winning bronze. Later on in the same day, 16 year old Nico Porteous won New Zealand's third Winter Olympic medal in the Men's Ski Halfpipe, also taking bronze. ^ a b c Leggat, David (11 June 2009). "21 Kiwi Olympians fail to register". The New Zealand Herald. Retrieved 30 October 2011. "New Zealand". International Olympic Committee. "Results and Medalists — New Zealand". Olympic.org. International Olympic Committee.